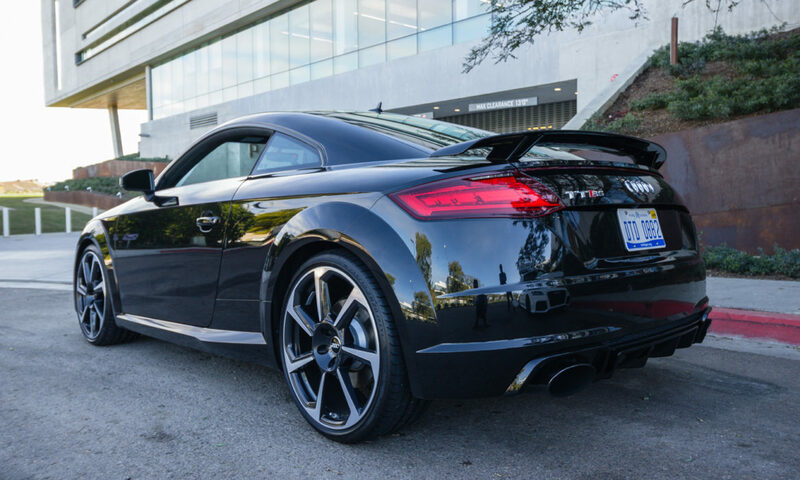 We drove the revamped Audi TT in 2015 and also the TT Roadster, both of which we loved. Now an even more anticipated Audi lands on our doorstep in the shape of the 2018 Audi TT RS and in a nutshell, it’s really really good. 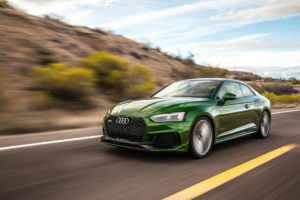 Fettled by Audi’s Go Fast Division to compete with BMW M cars, it also goes head to head with Porsche’s Cayman S, despite being both owned by VW. 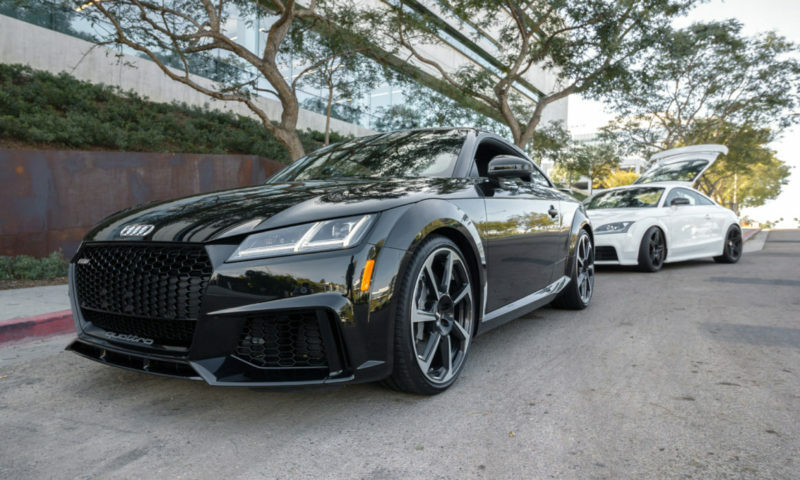 This isn’t the first TT RS we have had here, back in 2009 Audi launched a TT RS and made it available for US consumption in 2012. 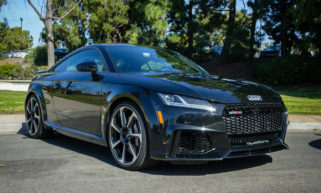 None of the U.S. cars had a dual-clutch transmission due to the very small volume that were imported so Audi of America had to choose only one transmission and they chose a six-speed manual. 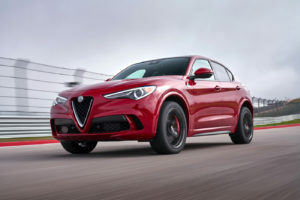 The U.S. car had more power than the Euro version 360 hp instead of 335 hp and with slick shifting reached sixty from standing in 4 seconds flat. Our 2018 Audi TT RS tester arrived in Mythos Black, a color really difficult to keep clean and scratch free but it looks really good. 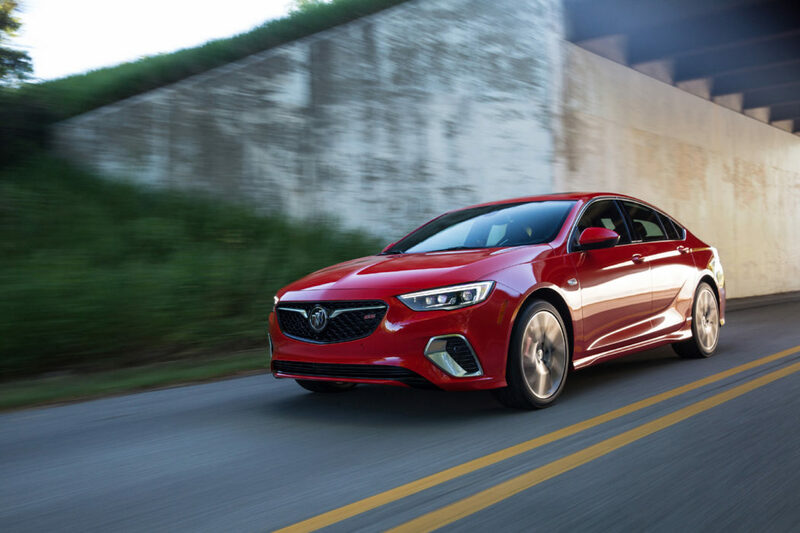 The rear fixed spoiler gave away that our car had the Dynamic Plus package which foregoes the magnetic system for even stiffer springs and tighter, non-adjustable shocks. 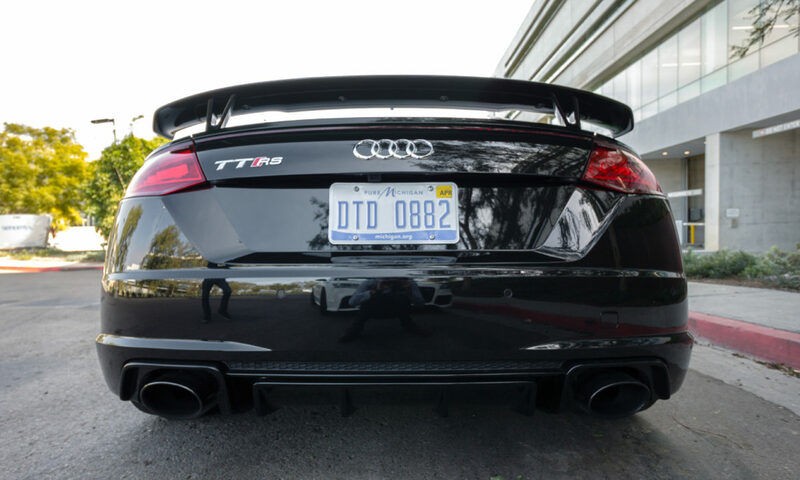 It also removes the top speed limiter so the TT RS is good for 174 mph. 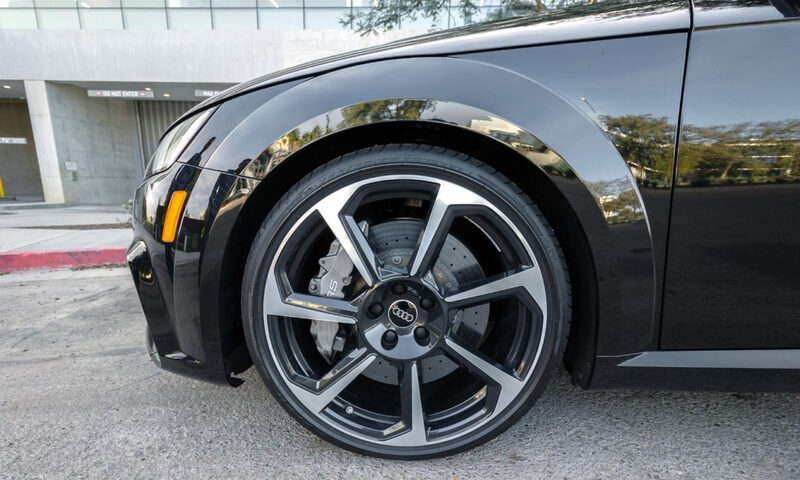 Packaged with 20 in, 7 spoke wheels shod with 255/30 Pirelli P-Zeros it rides very firm so if it was me checking the options boxes I would prefer the standard 245/35-19 option wrapped in Michelin Pilot Sports………my wife probably agrees too. 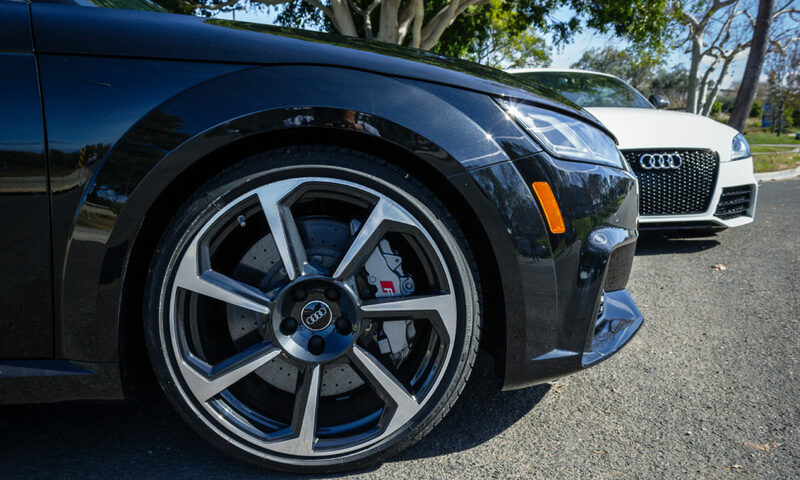 Up front the Plus package has Carbon Ceramic Brakes and normal ones at the rear, they work well considering the speeds this car gets up to. 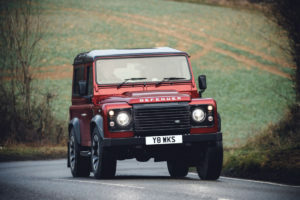 There aren’t too many cars that have had 5 cylinder engines, the old Acura Vigor, the instantly forgettable Hummer H3, the 2006 Ford Focus ST (actually a Volvo engine), the quaint Land Rover Defender and the iconic Audi quattro. 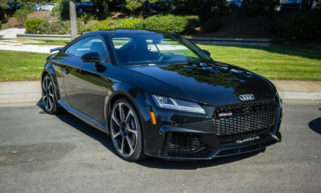 The current iteration of this 2.5 liter, 5 cylinder engine now puts out 400 hp @ 7000 rpm and 354 lb-ft @ 1700 rpm, enough to propel the now lighter TT RS to sixty, in as near as damn it 3.5 seconds. It took a few goes using launch control to get there but we finally beat Audi’s claim of 3.6 seconds……job done. On start up the car emits a throaty exhaust noise, enhanced by lowering the very small rear seats, creating a pleasant resonating chamber of sound. The rear seats are no good for people so why not make them serve this purpose. There is a button forward of the shifter that allows you to set the exhaust sound in either Standard or Sport….guess which one we chose? By choosing Sport, flaps open allowing more of the glorious noise to ring in your ears. 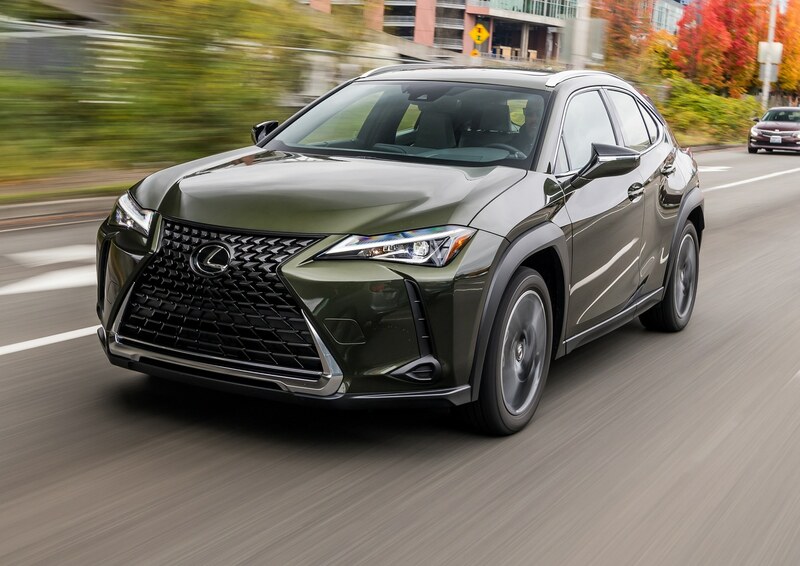 Even around town at slower speeds the exhaust farts and pops and the tremendous 7-speed dual clutch drops down gears with ease. 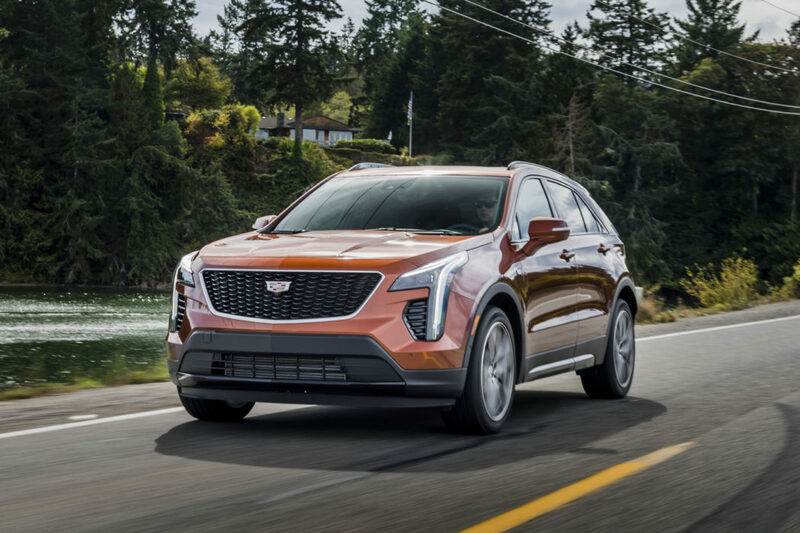 At full throttle with the gearbox shifting at at 6800 rpm, the transmission changes cogs at bolt-action speed, and the engine emits a guttural brrrapp, brrrapp between shifts, it’s positively grin inducing. We made several trips to some twisty bits in the mountains to the East of Sam Diego and this is where the TT RS really began to shine. 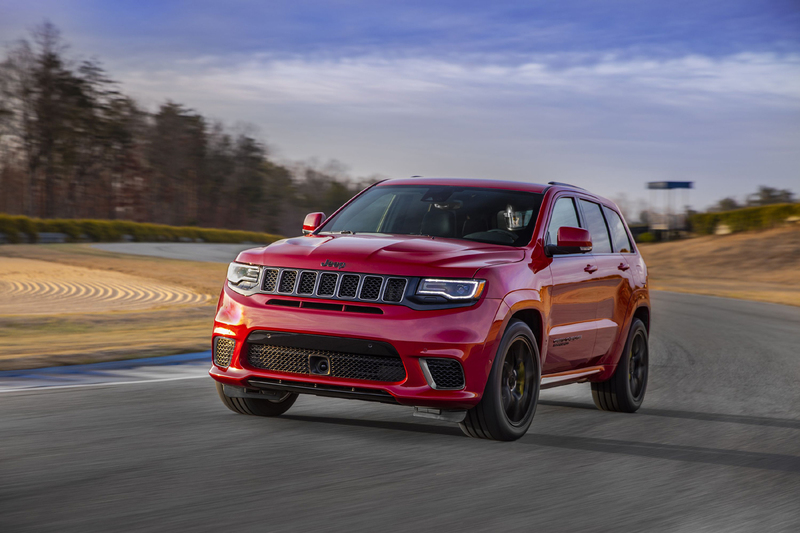 The upgraded Haldex differential is now able to push more power to the rear wheels than before, in fact, it can send 100 percent of the power to the rear wheels under a heavy right foot, which I seem to have. 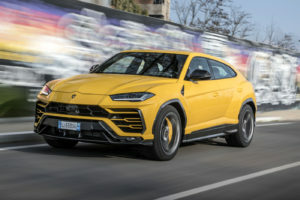 The steering is pretty quick and very direct, so together with the improved differential it makes for a total lack of under steer……you point, it goes. One small thing that irked us was if you mash your foot down and activate the kickdown switch, the car pauses while it emits a brrrapp, brrrapp, brrrapp, and then after a slight delay surges forward. This was slightly disconcerting the first time I attempted to pass 3 cars on a two lane rural highway, in fact, I aborted the attempt. Next time I only applied 80% throttle and this avoided this delay. I’m not sure if Audi added this as a gimmick or if our test car was off. Driving hard for a week did dampen the economy numbers and I achieved a not very respectable 16.5 mpg, admittedly this did include our acceleration testing and never driving with restraint. But how does it compare to the 2012 version? 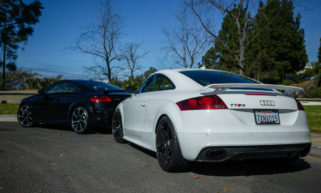 We were lucky to have access to a 2012 Audi TT RS owned by a friend of mine and he brought it along for a drive. Side by side there’s not much difference, the car is the same length and height and it weighs less thanks to the new MQB architecture and engine weight saving. Take a look at the front, however, and the TT RS now sports a new black honeycomb grille, which I rather like. 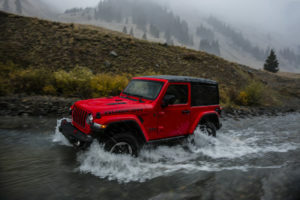 Jumping into the 2012 model and the differences are more obvious……the 2018 model has undergone a tech and styling transformation making the 2nd gen car look positively dated. Nick has made some mods to his car, so it now delivers close to the power of the current TT RS and maybe puts out more torque. Of course the newer model out guns it due to the quick shifting dual clutch transmission, you simple can’t change gear fast enough, but it was still great fun to drive. 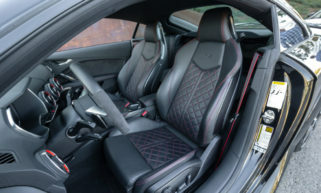 Inside, the TT RS is really only good for 2 people, the back seats are for small children on short trips or contortionists. They serve a better purpose as a storage area or that resonating chamber I mentioned earlier. So back to the front where the sports seats hold you in place very well and are comfortable without being too hard. 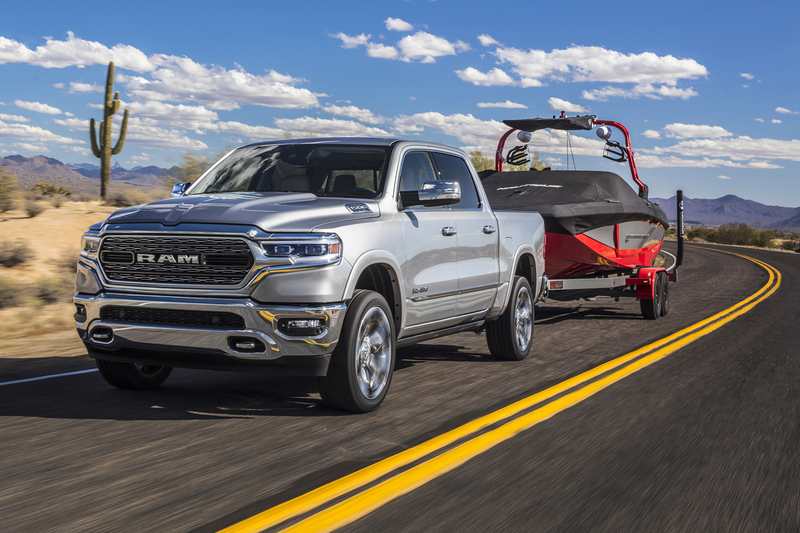 8 way power means it’s easy to find the perfect driving position. The quilted look seats have what Audi calls Crescendo Red stitching and cool red accents on the seat belts and the HVAC controls. It’s all very tastefully done. The virtual dash is the only screen you get, where you can access, entertainment, navigation, Drive Select modes etc. The passenger just gets to stare at the 4 circular vents or close their eyes. 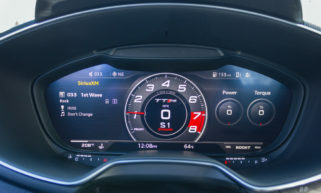 The leather and Alcantara sport steering wheel is a nod to the R8 V10, containing the virtual cockpit controls, ignition, and drive select buttons. Of course, just like the paddle shifters, anything on the steering wheel moves when you turn, so Audi has provided a non moving Drive Select button on the center console in case you suddenly feel the need to select Comfort Mode mid bend. As expected materials are top notch and the interior is full of brilliant detailing. I especially liked the propeller air-vents, which have controls for the entire HVAC system in the center of each. 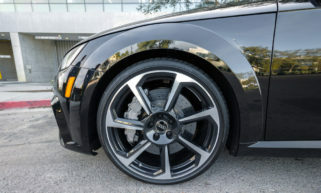 Additional options checked on our car: Tech Package including Bang and Olufsen Sound System ($3,500), RS sports exhaust ($1,000) as well as the aforementioned Dynamic Plus Package that will set you back a cool $6,000. 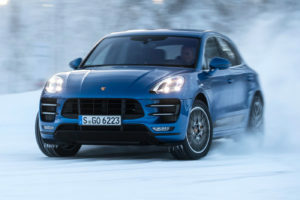 This car drops right into Porsche Cayman territory and if you drop the Dynamic Plus package, the Audi becomes a bargain considering a similarly kitted our Cayman S will cost you north of $80K. There’s very little to complain about here, except the ride with the Dynamic Plus Package is pretty harsh and there is some turbo lag from a stop. That said it has a fantastic engine absolutely full of character, a beautifully sonorous exhaust, which makes even a grocery store run an event, massive straight line acceleration, and a fabulous interior. 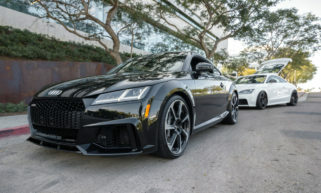 Audi has done an exceptional job with the TT RS, it’s simply massive fun……….but how does it stack up against it’s sibling, the RS 3?………find out next week.